Today we want to explain to you how to compare the uncomparable using the new type of price scale – Indexed to 100. Let’s look at the following situation – we need to compare value changes of two or more symbols during a specific time period. 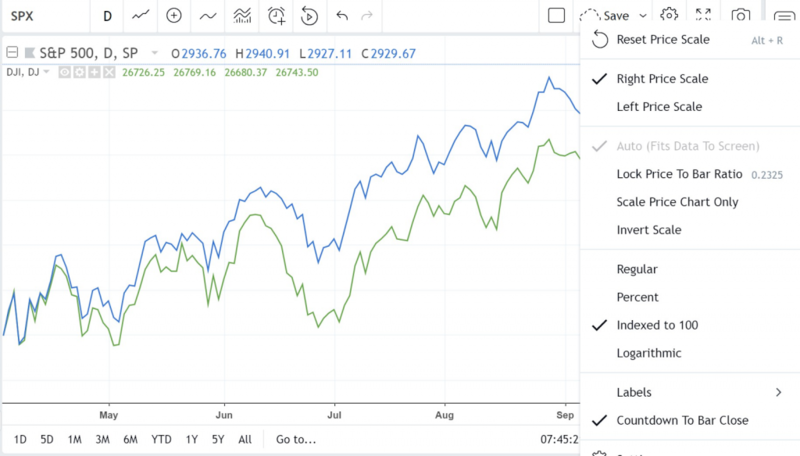 As an example, we’ll take DJI and SPX, add them to a chart and attach it to the same scale. What do we see? We see two detached lines that can’t be compared. But guess what? We are now able to compare them! Just enable Indexed to 100 in the scale settings menu. …and you get a chart that makes sense where you can compare the value changes. As a basis for comparison, take the first value on the chart and set it to 100 for all the symbols that you want to compare. To calculate the following values, we add the percentage change of each symbol relative to the first value to 100. Thus, we can make a comparative assessment of price changes of symbols traded in completely different price ranges with a different volatility.